Thanks for replies but its not the Antelope motorcyclist that I was referring to in my original post. Rather the big hairy type of biker that have an undeserved bad reputation. I think the "Old Dyers" (to give it its correct name) is the only biker-friendly venue left in Spon End, with the recent passing of the Shakespeare Inn? 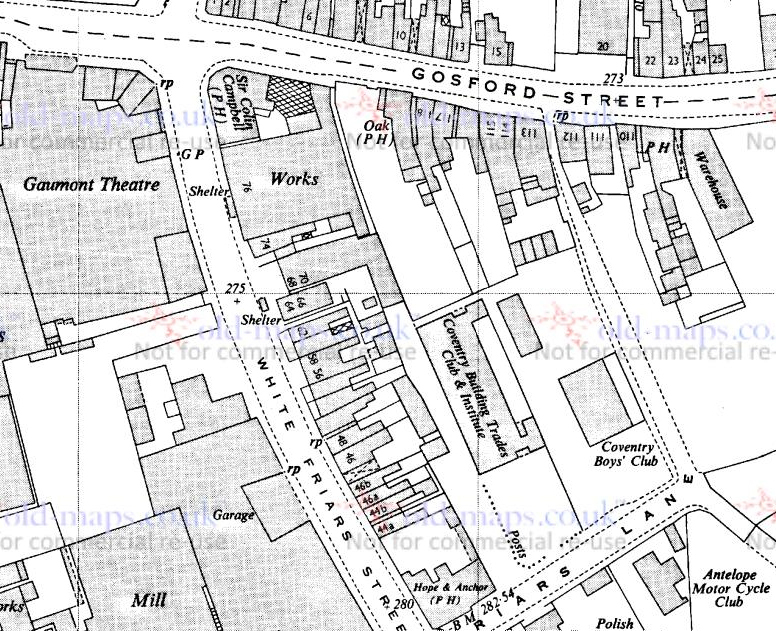 *There was once another "Dyers Arms" mid-way along Spon Street. Thanks for replies... Got the word yesterday evening that the council have given permission for a mini Bull Dog Bash in Butts Park but still not sure of a date. On 14th Nov 2012 2:53pm, dutchman said: When they were based in Whitefriars Lane the nearby Mermaid Inn in Gosford Street was their unofficial 'watering hole'. I have some old slides of scrambling at Hawkesbury and just wondered whether the meetings were organised by the Antelope Club? The slides would date from the 50`s. On 14th Nov 2016 12:53pm, w-aussie said: I was a "firey" on the first response to the fire that nearly took out the Mermaid. The Mermaid was never in danger, you may be thinking of the Peacock which survived by some miracle? On 14th Nov 2016 12:53pm, w-aussie said: I seem to remember the Antelope Club being @ the rear of the old Gaumont cinema, or have the (many) beers dulled my memories? Hi Ruth, yes, probably not long after it opened, late 60's. I was the only mod/skinhead that the usual members (more of the longhaired type) let in! I remember some of the discos. Living locally was another reason and I occasionally frequented the Tam 'o' Shanter Club next door (usually to use the phone) or the re-located West End Club around the corner. Sad to hear that Arthur Davis, long time Secretary of the Antelope has died. He was a good friend of my older brother Allen Oldham but I knew Arthur from the time he worked in No 2 Test House & I worked in the Aviation Laboratory at Dunlop back in the late 60's early 70's. R.I.P. Arthur. I worked with Arthur, he was a great guy and a real gentleman. R.I.P.